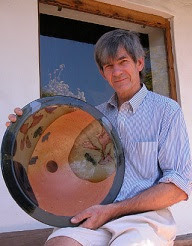 Andrew Walford will hold an Open Day at his pottery in Shongweni on August 9 from 10h00 to 18h00. There will be hundreds and hundreds of pots as well as breyani , Biscotti homemade lemon juice and tea or coffee in handmade Japanese style Chawan. Chill with friends on the lawns and admire world class ceramics and amazing views of Shongweni Dam and Game reserve. The venue is 1km down the hill from Shongweni Farmers' Market.